The homepage of the Alaska Dispatch after the sale was announced. 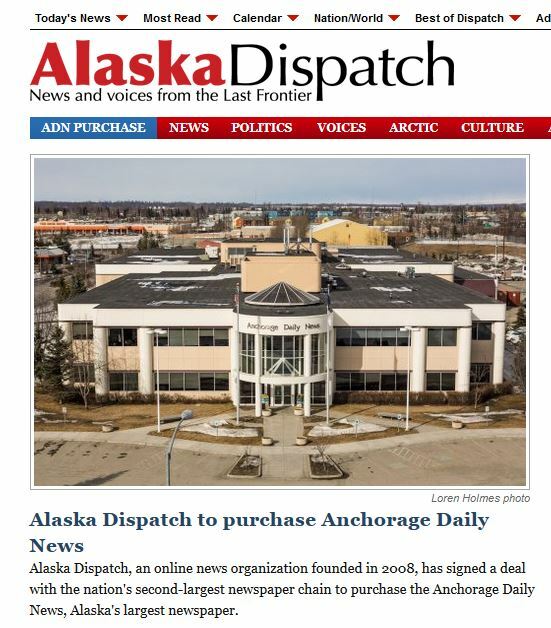 The owner and publisher of the online news organization Alaska Dispatch is purchasing the Anchorage Daily News for $34 million. The ADN is Alaska’s largest daily newspaper and owned by The McClatchy Company, which publishes 29 other daily newspapers in 28 U.S. cities. The Alaska Dispatch was formed in 2008 by former Anchorage Daily News reporters, including Tony Hopfinger. The next year, Alice Rogoff, former U.S. News and World Report chief financial officer, became majority owner. Hopfinger is Alaska Dispatch executive editor and president. “We’ve always been looking for ways to improve and expand journalism in Alaska and so this is an opportunity to produce a more comprehensive news product and to hopefully reach all corners of Alaska,” he said in an interview with KTOO. While the two companies are merging, Hopfinger said the current focus will be on a smooth transition. The Anchorage Daily News distinguished itself in Alaska journalism as the winner of a long-fought newspaper war with the Anchorage Times. The Times was published by Robert Atwood, known for his efforts to move the state capital from Juneau. In 1974, the two companies entered into a joint operating agreement in order to reduce costs. Then in 1980, McClatchy purchased 80 percent of the ADN from editor and publisher Kay Fanning. The Daily News was struggling financially at the time and the California-based company invested significant resources into its northernmost newspaper, constructing a new headquarters in Anchorage in 1986. The Anchorage Times went out of business in 1992. The Daily News won a Pulitzer Prize for public service reporting in 1976 for its series on the influence of the Teamsters union in Alaska. In 1989, it won another Pulitzer for a series on alcohol and suicide in Alaska Native villages. Hopfinger says the ADN will continue to be sold on the newsstand and by home delivery. The Alaska Dispatch purchase of the Anchorage Daily News is expected to close in May. The deal includes the adn.com website and the newspaper’s building in Anchorage. The Dispatch and ADN will rent from GCI.